I’ve never seen this cute little guy. 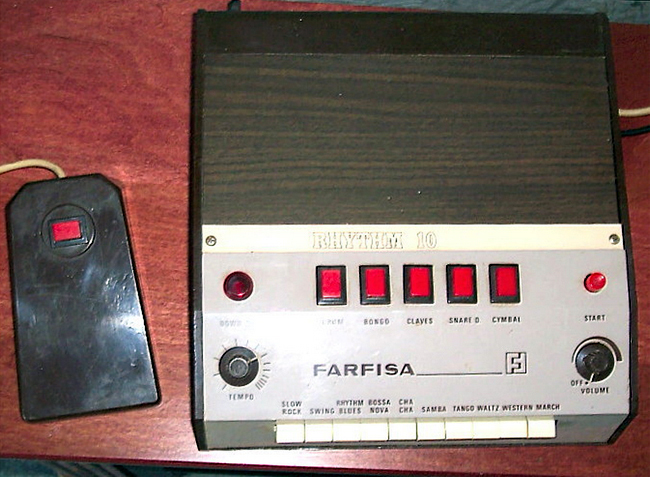 I assume the Farfisa Rhythm 10 Drum Machine was a result of the partnership with CMI, and very similar to the Maestro Drum Machines of the same era. It’s on ebay right now. Farfisa Drummer Model 10, this is from the same company that made the organs. This seems to be overall clean shape, all the buttons work. It runs on 6 medium sized batteries and the footswitch is for momentary stop – when you release the button the drums continue. It has an attached guitar cord that goes from unit to amp. Also an 1/4″ jack in the back with control…. I am not sure if this is additional input for an intrument or not. It has separate buttons for individual drum effects as well as tempo and volume control. It has several pre-set rhythms. This was very modern when it came out in the late 70’s early 80’s. Does anyone have a schematic for this drum machine?